First appearing on BBC Radio, this Science Fiction comedy from the pen of (the sadly departed) Douglas Adams, spawned five books, a TV series, a computer game, and towels. In our opinion, the BBC radio series is the best way to experience Hitchhikers, and fortunately, the original radio series, plus three new series, are available. If you’re new to the world of Hitch-hiker’s Guide – a) Where have you been? and b) No excuses – get yourself a copy of the original radio series (CD or download), and get immersed. Essentially, this is the story of Arthur Dent, a man who wakes up in the morning, and shortly thereafter, has his planet blown up. He manages to escape the Earth in the company of his odd friend Ford Prefect, who’s a researcher for that wholly remarkable book, the Hitchhiker’s Guide to the Galaxy. The series follows a fairly random wander through the galaxy, on a quest for the ultimate question of Life, The Universe and Everything. Arthur’s sub-quest, is to find a nice hot cup of tea. Hitchhiker’s Guide is an inspired piece of comedy / sci-fi, written for the best medium for such comedy… radio. Go listen to it now. Before it’s too late! Radio Series: The definitive version, and where it all started. The first 12 fits are available on CD and available for online download. A new series, the Tertiary Phase was broadcast in Sept/Oct 2004. The final two series started broadcasting in May 2005. See our dedicated H2G2 radio series page for more. Books:The Trilogy in 5 parts: The Hitch-Hiker’s Guide to the Galaxy, The Restaurant and the End of the Universe, Life The Universe and Everything, So Long and Thanks for all the Fish, and Mostly Harmless. Available from Amazon.co.uk. TV series: Generally regarded by most observers as “ok”, but not a patch on the radio series. Available on Video and DVD. The DVD is great value for money, containing two DVDs – the series itself, plus a stack of bonus material including an hour-long “making of” video, outtakes, a deleted scene, some fairly odd behind-the-scenes studio stuff, and an appearance by Peter Jones (the voice of “The Book”). May 2005 – Final radio series , ‘Mostly Harmless’ started 31 May 2005 on Radio 4. Hitchhiker’s on the radio. May 2005 – New products announced – London’s Science Museum will be holding an exhibition dedicated H2G2 from 28 May to 27 November 2005. Visitors will learn about Douglas Adams and the heritage of the Hitchhiker s Guide to the Galaxy. Something not to be missed. Jan 2005 – The Year of the Film is upon us! Details of Hitch-Hiker’s Guide to the Galaxy – The Movie are firmed up, and the film is currently is post-production. We can expect to see it in early May, and if you’re clever and know you’re way around the Internet, you should be able to get to a trailer of what the film is likely to offer. Hopefully, this will see a big surge of interest in Hitch-Hikers (again), introducing a whole new generation to HHGG. Know who’s cast as Arthur, who’ll play ‘The Guide’, and which bearded English comic will play the rather unlucky sperm whale? Oct 2004 –The Tertiary phase of the Hitch-Hiker’s Guide to the Galaxy radio series finished its first run on Radio 4 on the 26th October. According to Dirk Maggs, director of the new series, we can expect eight more half hour episodes comprising the Quandary (So long, and thanks for all the fish) and Quintessential (Mostly Harmless) phases in late April 2005 . March 2003 – Wonderful to see this back in print, The Hitchhiker’s Guide to the Galaxy – The Original Radio Scripts is a must for any fan on the radio series, the first incarnation of the series. This nearly-A4 publication of 260 pages commemorates the 25th anniversary of HHGG and has been updated with new material since the first publication back in 1985. New material includes a lost Hitchhiker’s script and a who’s who. The book is dedicated to all BBC Studio Managers, and includes a great insight into the series recording, including how Marvin’s effect loop kept getting lost and trodden on, how they made the choir of robots, and how the last episode nearly didn’t make it air at all. Each episode is listed with original direction notes and effects, plus notes on the recording techniques and problems they encountered during the making of the series. A must-have, and not much over £10 from Amazon. March 2003– ‘Hitchhiker: a Biography of Douglas Adams‘, by M.J. Simpson published. This book tells the story of Douglas’ life and works, including interviews with colleagues and friends. At the time of writing, I’m working through Douglas’s school years (plus snippets from his early writings for the school magazine.. late, of course), and it’s an excellent and engrossing read. Hardback, and available from Amazon. May 2002 – If you’re a Douglas Adams fan, take a look at The Salmon of Doubt – a posthumous book based on the contents of DNA’s Mac harddrive. The title comes from the unfinished third book in the Dirk Gently Holistic Detective Agency series, and includes as much of the story as could be re-created. Many of the rest of the 50 or so articles in the book are non-fiction, and reflect Douglas’s interests, including computing, technology and wildlife. By it’s very nature, it’s a disjoined book, through which those not familiar with Douglas’ work will struggle – but for those who’ve followed his work, this gives an insight into what he was working on in the latter years of his life. 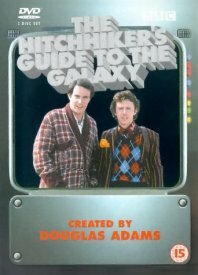 For details of when you can next catch Hitchhiker’s Guide on UK radio or TV, give the DigiGuide listings service a try. For more on DigiGuide for TV and radio listings, see our Digiguide page. Hitch-Hikers in the real world – Just how real is the H2G2 Universe created by Douglas?